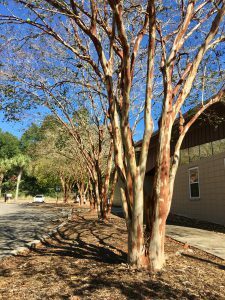 Why Butcher a Nice Crape Myrtle? Too often people hack away at crape myrtle trees and “butcher” them. The term “crape murder” was coined to describe this drastic topping of crape myrtles. replacement with a smaller-maturing cultivar. The real problem here is that you have the wrong plant in the wrong place. The person that planted the tree did not do their homework. To avoid having to annually “butcher” a nice tree, choose a smaller maturing crape myrtle. After topping, the tree will insist on growing to its genetically designed size, again and again. If you want a crape myrtle that will naturally stay below four feet in height, buy a dwarf cultivar such as Pocomoke. There are semi-dwarf cultivars that grow to about twelve feet or less in height such as Acoma. There are intermediate crape myrtles that top out at less than twenty feet in height such as Osage. And there are crape myrtles that grow greater than twenty feet in height such as the popular Natchez cultivar. Choose the right size plant to fit the selected space. through photosynthesis. The large open cuts caused from topping invite wood-rotting organisms and ultimately decay. Topping results in many dead stubs throughout the tree. 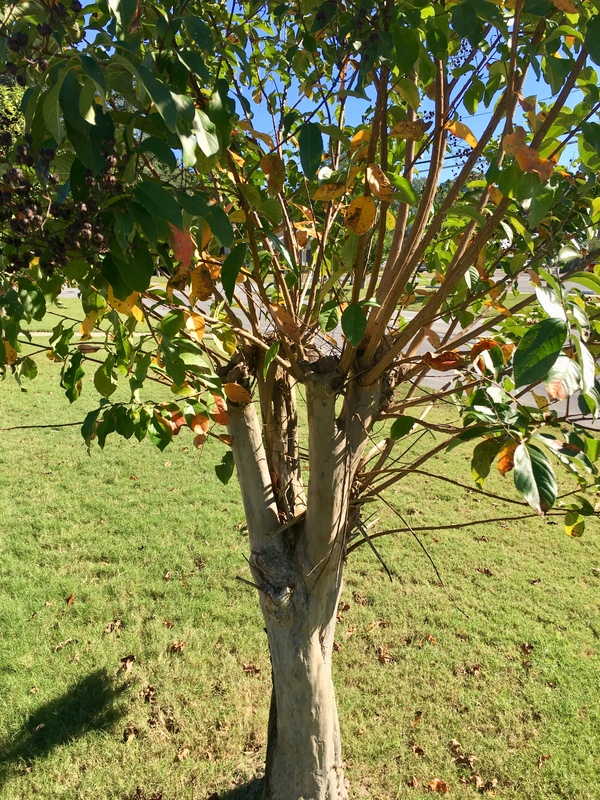 Topping a crape myrtle forces the tree to produce many unsightly root suckers. Ultimately, topping results in an ugly, odd-looking, higher maintenance and short-lived crape myrtle. Many people believe crape myrtles have to be cut way back in order to produce an abundance of blooms. Flower clusters may be slightly larger on topped trees. But topping usually delays flowering up to one month and since the tree is smaller, it produces fewer flowers. 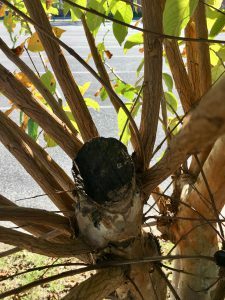 The long, weak shoots supporting the large, heavy flower clusters on topped crape myrtles bend awkwardly and are more likely to break away from the plant. When pruning crape myrtle trees, avoid cutting back or shortening branches much larger than your finger, although cutting larger branches back to a side branch or to the trunk when needed is fine. 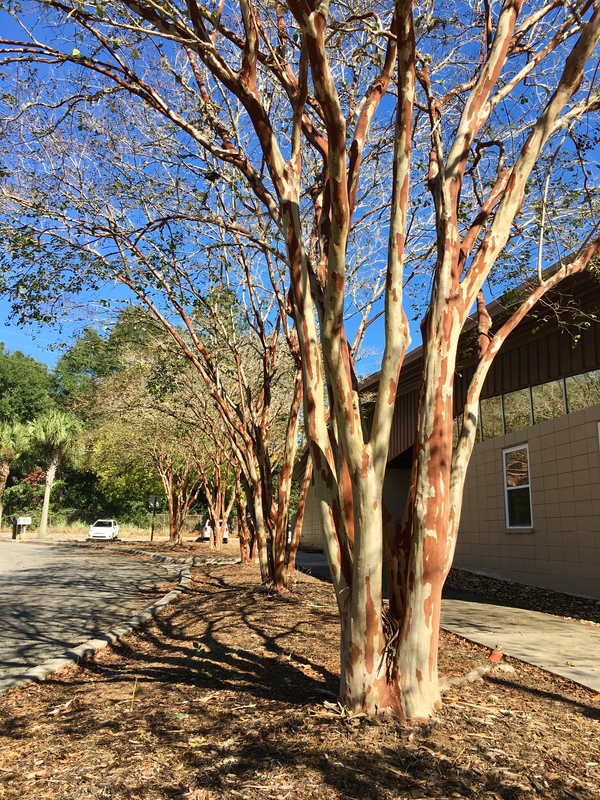 More information on crape myrtle selection and care is available at the below links. Larry Williams is the County Extension Director and Residential Horticulture Agent for the UF/IFAS Extension Office in Okaloosa County.